Australia’s Lucas Heights nuclear reactor is touted by ANSTO (Australian Nuclear Science and Technology Organisation) as a reactor for medical purposes. But it never was primarily so. The first Hifar reactor was built in the 60s as a research reactor. The radio pharmaceuticals facility was literally tacked on at the end of the reactor. When reviewed recently by ARPANSA, the new nuclear reactor was shown to be not up to the requirements of a commercial radio pharmaceutical facility. As a producer of commercial radio pharmaceuticals, Australia’s nuclear reactor is unsuitable, and not commercially viable. ANSTO will claim that it is. But that means ignoring the massive tax-payer cost of the reactor, its security, and its waste disposal. Not only more economic, but also more efficient – linear accelerators could be set up in several places, thus providing backup, and eliminating the problem of radioactive wastes. Why then does Australia have the Lucas Heights nuclear reactor? The answer is that it offers a “cover”, respectability, for the nuclear power and nuclear waste industries to get into this country. 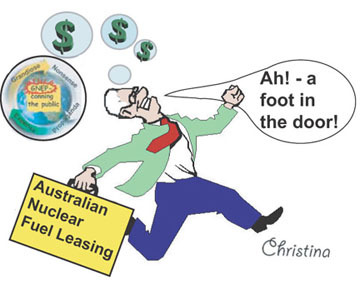 The real agenda for Australia’s Lucas Heights nuclear reactor has always been to maintain an opening for the nuclear industry. With Lucas Heights and ANSTO, nuclear expertise is continued, in preparation for possible Australian nuclear power, and nuclear weapons. 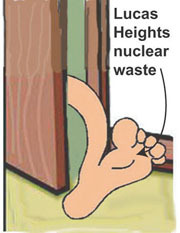 The Lucas Heights nuclear reactor now functions as a support for the Australian uranium industry, and a foot in the door for an Australian nuclear waste import industry.